Your Search Committee is continuing to meet regularly in preparation for hiring a new minister. We are looking forward to reviewing your Survey responses. This will help us to understand who we are as a congregation and what qualities our new minister should have. We are also continuing to prepare our congregational packet to present ourselves to prospective candidates. Please complete your survey as this is your opportunity to express your opinions and your concerns in this important step in the evolution of our congregation. 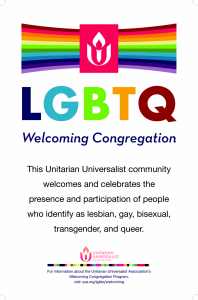 UUA is providing us with a workshop and Sunday service called Beyond Categorical Thinking. It is designed to broaden our thinking about what types of candidates we may call to be our minister. The date for this program will be announced soon. Plan to attend. We are sure to learn a lot about ourselves and the exciting future we can create.